The Monmouth Academy alum had big shoes to fill when she arrived in New London, but is improving as a pitcher. Kristine Kahl knew she wanted to attend the Coast Guard Academy by the time she was a junior at Monmouth Academy. It helped that her older brother Elliott was already enrolled at the New London, Conn. school, but what sold her was the one-week Academy Introduction Program she attended during the summer. It helped both Kahl and the academy that she was an accomplished high school pitcher for Monmouth. Kahl came in last year following Hayley Feindel, the school’s best-ever pitcher and a Division III All-American. Kahl finished at 15-8 as the Bears’ primary pitcher. Although she was pretty overpowering against Mountain Valley Conference opponents in high school, hurling three no-hitters and four one hitters her senior year alone, Kahl has never considered herself a strikeout pitcher. 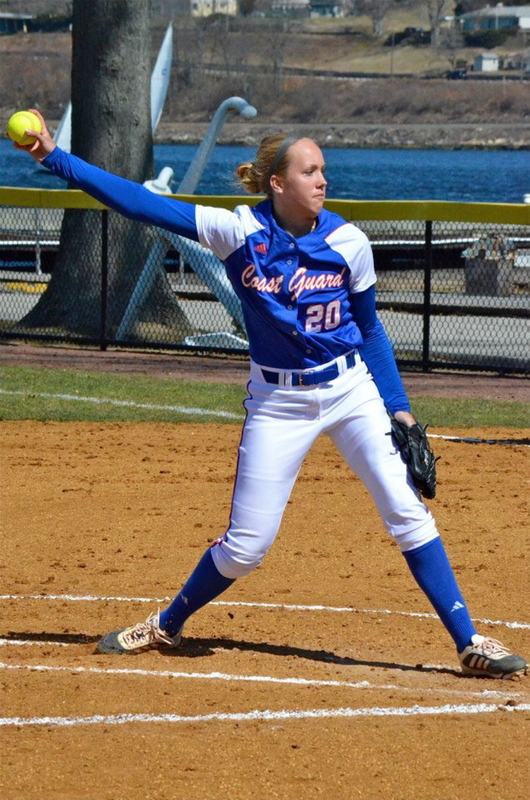 She realized that while pitching against top competition on her Gold Thunder travel team during high school. Poor weather has already postponed all six of the team’s New England Women’s and Men’s Athletic Conference (NEWMAC) games. So far Kahl has split pitching duties with sophomore Sarah Sorensen, going 4-2 with a 1.18 ERA. Once the schedule picks up, so will Kahl’s innings. With the schedule backed up the way it is, Kahl is grateful for any help she can get. She’s adjusted to sitting out games, but not being in the batting order when she pitches was even tougher. The Bears are 7-7 in non-conference play and both Kahl and her coach believe they can get a top four spot and a home game for the NEWMAC playoffs. Last season they went 22-17 overall and finished third in the conference tournament. Kahl is majoring in environmental science with a focus on biology and physical oceanography. She’ll graduate with a bachelor of science degree as an ensign with a five-year commitment to the Coast Guard. She’s unsure if she’ll make a career out of the military, but likes the military life. Kahl and her fellow first-year cadets spent part of last summer on the academy’s tall, three-masted sailing vessel, the Eagle, traversing the East Coast from Florida to Canada. This summer, Kahl will train some of the incoming cadets. There’s a heavy load of credits to wade through at the academy and cadets are restricted to the base except for weekends. The best part is her schooling is paid for by the U.S. government. “For anybody who’s willing to put in the work to do it, I highly recommend it,” Kahl said.